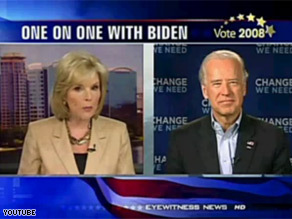 Sen. Biden had an interview with Barbara West Thursday. (CNN)— An interview Sen. Joe Biden did with an Orlando television station is making headlines Sunday, after the reporter asked if Sen. Barack Obama's now famous conversation with 'Joe the plumber' about 'spreading the wealth' made the Democratic nominee seem like he was adopting Marxist principles. "You may recognize this famous quote," WFTV Anchor Barbara West told Biden on Thursday. "From each according to his abilities to each according to his needs, that's from Karl Marx. How is Senator Obama not being a Marxist if he intends to spread the wealth around?" Biden laughed himself out of the unusually tough interview asking in response, "are you joking? Is this a joke?" "Is that a real question?" Biden continues. "That's a question." West said. With a chuckle, Biden firmly tells West, "He is not spreading the wealth around. He's talking about giving the middle class an opportunity to get back the tax breaks they used to have." "We think middle class tax payers should get a break, that's what we think," Biden added. "That's a ridiculous comparison with all due respect." Obama has responded numerous times since his October 12 meeting with Joe Wurzelbacher in Toledo, Ohio that the conversation was taken out of context. Since the final presidential debate in Hempstead, New York, 'Joe the plumber' references have been a common line of attack from Sen. McCain and Gov. Palin - telling voters - Obama plans to tax the American people. WFTV's news director told Conde Nast Portfolio.com that West had not been inappropriately tough, citing an even tougher interview she did with John McCain. I just reviewed the link to Conde Nast Portfolio.com that you made and you made a HUGE ERROR. Nowhere does the WFTV's news director say she did "an even tougher interview she did with John McCain." The blog post you linked to was pointing out how she was throwing softballs to McCain. wah, wah, wah, the press core asked the Obama campaign a real question, how dare they. There only supposed to talk about how he's our savior! Foreigners – you say – who cares! Yes! but can so many people be so wrong! The poll was conducted online from Oct. 1 to 13 by Harris Interactive, in partnership with France 24 and the International Herald Tribune, among 6,276 adults, ages 16 to 64, in Britain, France, Germany, Spain… and adults, ages 18 to 64, in Italy. Most interviewers idea of a "tough" question usually turns out to border more on the RIDICULOUS in actuality! There is no relation between taxes and Marx. Socialism is not about allocation of tax burdens. It is about allocation of economic systems under governmental control so that each individual gets a fair proportion of the proceeds. Interesting>i just read that Palin is complain about the K.Couric interview.That was no fair interview.Joe Biden was Interview with lies Questions.Words/Question lies from de McCain/Palin camp. West have show her real color ,her real face. yes so sweet was she with McCain. Those Question aren`t tough question ,they were punk`d questions. Biden did a good job. her real McCain Rep..... color. This women is not a reporter she is a partisan hack. There is enough of this on both sides no wonder the media has become so disliked. What happened to real journalism? All we have is partisan pundits masquerading as journalist's. If helping the poor out, which is SuPPORTED by God, is Marxist, then helping the rich to be richer, the work of the Devil. God did say that 'money is the root of all evil'. Finally, we are about to free ourselves from the rancid, stinking claw of neo-conservatism. This seems so unreal ! is this WFTV so illiterate that she could really think Sen. Obama is a marxist ? and that she finds this question is relevant ? This is not a though question. This is pure, and clumsy, manipulation . I cannot imagine anyone is taking this seriously, and I don't understand CNN is reporting this. He did handle the heat. The questions were ridiculous. Search it. She basically repeated McCain campaign talking points. It was disgusting from any political perspective. Ms West is married to a GOP strategist. I expect an interviewer to at least pretend to be unbiased. She certainly had an agenda and didn't have her facts straight. She should be fired over this Guess she won't be invited to the victory celebration. More name-calling? And this time by the so-called news interviewer no less!! wasnt palin just convicted of a crime?, dealing with troopergate?, america is lost. so lost.